A friend of mine was knitting at a concert a few weeks ago while she listened, and I thought of this clever little device. I’ll admit that I am not exactly sure how it works, as I am not a knitter, but I think I understand the principle. Simply put, losing track of where you are in a pattern is bad! This “knitting clock” is used for counting rows as you knit. Sighted people might use a pencil and paper, or a mechanical counter. 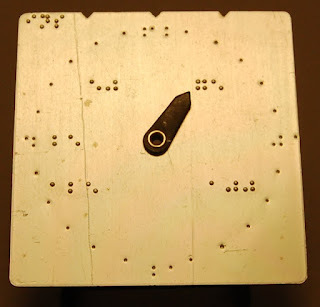 It was adapted and sold by the Royal National Institute for the Blind in England, sometime after 1953. It consists of a square aluminum plate with black plastic pointers on both sides, fixed at the center. 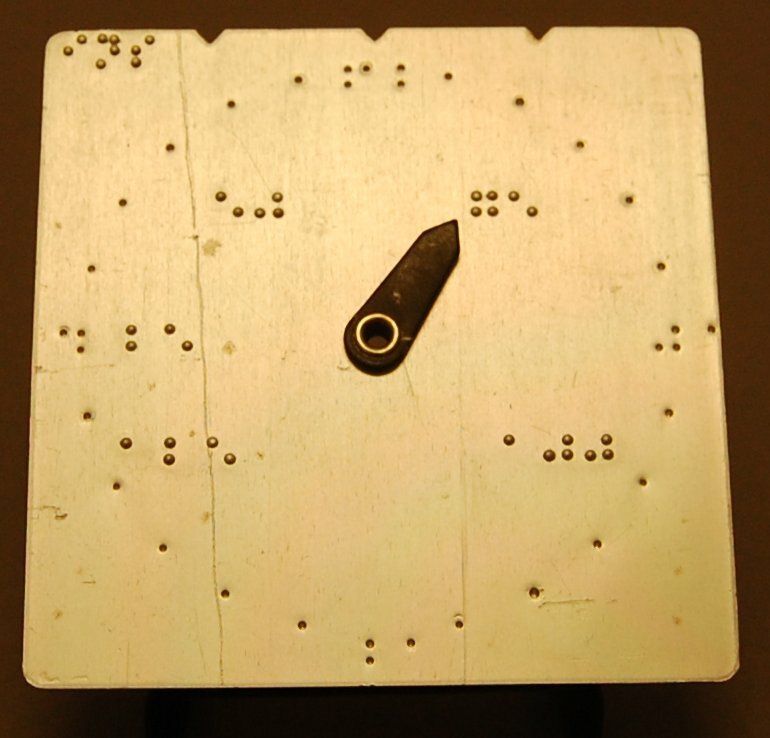 The side with the longer pointer is brailled with the numbers 6, 12, 18, and 24 in a clockwise pattern beginning at center right. There are 5 single dots between each number. The side with the shorter pointer has three evenly spaced inch marks along the top edge, in the form of notches. Numbers 25, 50, 75, 100, and 125 are brailled around the pointer. Photo caption: Aluminum and plastic knitting counter.